Who am I kidding the wildest thing is my life if my cheetah scarf or leopard shoes. Yep, here I am with my new best friend Mr. Walker. He is trusted to get me to the bathroom umpteen times a day and where ever I can manage to wander in my confined space. He also now has his own fashion pouch attached to the side. It has become extremely handy since I have to put all of my pressure on the walker to lift my weight up and off my leg so that makes carrying anything in my hands impossible. What do you guys think should I jazz him up with a little leopard duck tape? Yesterday we were invited to a Patriot Day pig roast. I wasn't sure if I would be able to handle it but decided to try as this was my first official outing in almost 3 weeks. It was held at my best friends house so I knew I would be surrounded by friends as close as family. I got through for a couple of hours and that was all she wrote. I meant to have the Man take some pics while we were there but, I guess I got so tired I forgot. After we came home and I sat in my much loved recliner I asked the Man to take some shots. The reason I wanted pictures was not to show my glamorous self but, to show you this awesome sweater that I up-cycled earlier in the week. Every time I click on Pinterest I see the most wonderful long sweaters paired with leggings or skinny jeans. When I try to find out where to purchase these gems I find that they start at about $75.00 and rapidly go up. I found this sweater for $2.50 in the plus size department at the thrift. This is actually a great section to look for long tops and sweaters. I tried it on and decided that 3" would need to be removed from each side and almost two from the width of the sleeves. (I always forget to take the before photo so you'll just have to trust me!) 30 minutes later and wallah! I love it! I am sure it will be one of my favorite pieces through fall and winter. I have a few more packed away in storage that will be getting the same nip and tuck. My only regret is that I can't wear any of my boots. Not that any of them have spike heels, maybe 2" or so but, I'm only supposed to wear flats until I'm 100%. That's especially frustrating since I bought a beautiful pair of black, leather knee highs during the summer. What the heck $140.00 full price which ended up being $28.00 clearance and coupons at Carson's. I still look at them and whisper sweet things so hopefully they will be as patient with me and not run off. Now a bit about my recovery. So you can skip this part if you are already bored. I went to the Dr. on Thursday. Due to the conversations I had with my physical therapists I was sure he would put me on more pressure on the injured limb and would be starting on stairs Friday. To my amazement he was adamant that I was to stay away from stairs for at least another month. When I explained that my PT thought I would be starting stairs the next day he just shook his head and told me that she was used to dealing with people in their 80's and being to aggressive in her thoughts. He said that I had many years ahead of me and as healthy as I am he didn't want to risk anything going wrong or not healing properly (ie shortened leg and a life long limp) I just replied yes sir! He is a wonderful, young doctor. I have faith in him so I will do my part and obey his orders. The issue is that nobody believes me when I tell him what he said. You don't know how many times somebody mentioned how "old" people must heal much quicker than someone my age. I don't know if I was being overly sensitive or they were really just being highly sarcastic. I pick sarcastic! I finally gave up and plugged my little speaker into my I phone and listened to some Adele to keep me sane and relaxed. I really appreciate the care he is giving me and I think if it were up to him I would not be returning to work for another 8 weeks. As this is just not possible in my world he promised he would reconsider and to call him in 2 weeks for an updated return date. Oh my, I am rambling. I guess when I write it vs. talking about it a lot more comes out. After all I did warn you that I would be using my blog as a healing tool! So have a good week my fashionista friends and if you stop by leave me a comment. Now more than ever they mean so much to me. Linking up with Visible Monday and Monday Mingle. I know I look tired in the photo. Do you know why? Not the lightening, not the photographer, simply put I am exhausted! There, no excuses. I feel better already! You look great, Tammy! And, YES, jazz up Mr. Walker. I think you should do him up in Black and White duct tape and put a bow tie on the front,so her always looks his formal best!! You really do look good and I am glad to see you up and about so soon! 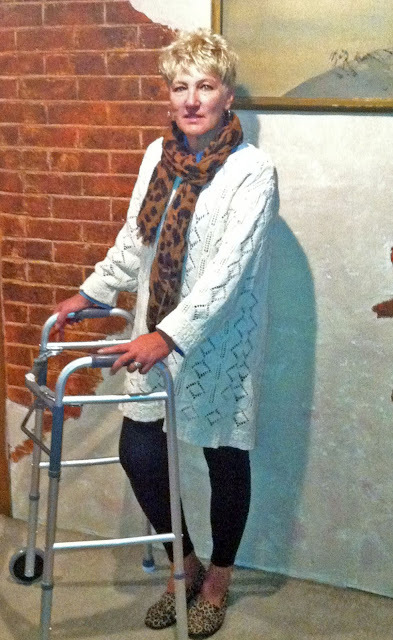 Wow, if I look HALF as good as you if/when I am obliged to use a walker, I will consider that a victory! And I'm with Pam -- jazz up Mr. Walker any way you'd like. As for the "helpful" folks who want to offer "advice" -- well, if you can't pretend to have early-onset deafness, Adele will have to do. Rock on, my friend. Love the leopard flats and scarf! I'd say you're doing well to get a blog post up--that's better than I've done the past week. It sounds like you have a bit more mobility having gotten more used to the walker (and by all means doll that walker up). I believe what the doctor told you. Take good care of that body! I'd say you're the most stylish woman I've ever seen with a walker!! Love the leopard accessories and the long sweater! You look fabulous to me! You look fabulous!! So wonderful you're keeping your sense of humor!! I think leopard duct tape on hte walker would be AWESOME!!! Maybe some rhinestone blingy!! You do look stylish, Tammy - tired yes, but who wouldn't be? I agree with Terri that your doc probably knows best for your healing. Please take it easy and keep listening to that glorious music : > Thanks so much for sharing with Visible Monday. Hello Tammy! Definitely better to heal properly, I agree with that fine young man! You look great, even if you don't think so- it's a lovely sweater! Lovely sweater and it looks fabulous on you. The leopard shoes are a stylish touch. I think sometimes the PT people forget that we are humans and not robots. They expect so much in such a short time. I think if they ever had to go through what their patients have they might be more understanding. Some are just jerks. It takes a lot of energy to use crutches or walkers if you don't have two good legs. Your body is healing too and that takes a lot of energy as well, so no wonder you are tired! If you can, don't rush going back to work. It will take A LOT of energy to do that. Maybe you could go back part time at first. You have been through a real trauma! Take care of yourself. Tammy, I have been a bad blogger friend lately- I just read your story about your accident- ouch! It's so nice your fam and DR are taking such good care of you and I don't know who could pull off walker fashion quite as well as you! Rest up, and see your time off work as ample "Tammy time" to focus on relaxing activities! The sweater came out really great! Don't you wish you could just give yourself such a quick makeover? Oh well, hang in there.